Custard pies were very popular a hundred years ago. 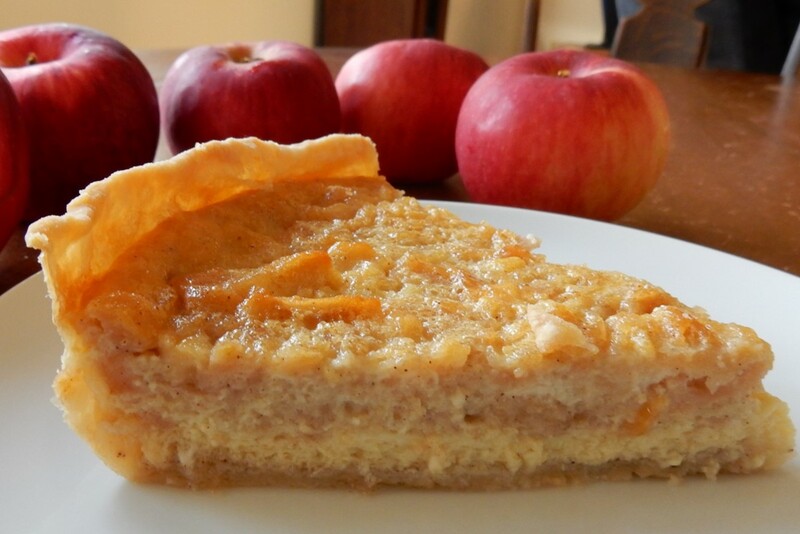 One of the old-time fall favorites is Apple Custard Pie. The delicate custard taste mingles with the apples and a hint of cinnamon to create a truly special pie. Combine apples, cinnamon, and water in a saucepan. Using medium heat, bring to a boil and then reduce heat; stir occasionally. If needed to prevent scorching on bottom of pan, add a small amount of additional water. Continue to simmer gently until the apples are soft (approximately 10-15 minutes). Cool slightly; then strain the apple mixture. Keep the cooked apples and discard the liquid. Set aside. Heat oven to 425 degrees. In a bowl, beat eggs slightly. Add sugar, salt, and milk. Beat until blended. Stir in the cooked apples. If the apples are still hot, use care to stir while pouring them into the custard mixture to ensure that none of the egg coagulates from the heat. Pour into the pie shell, then bake at 425 degrees for 15 minutes. Reduce heat to 350 degrees, and bake an additional 1 – 1 1/2 hours or until knife inserted into center pie comes out clean. This pie takes a long time to bake. If the top looks like it might start to burn before the center of the pie is solid, reduce heat to 325 degrees. For this recipe, I used apples from a tree in my yard that, when cooked, get soft and do not hold their shape particularly well. I like how the cooked apples are widely dispersed in the custard; though, if preferred, firmer varieties may be used. Posted on November 8, 2015 November 8, 2015 by SherylPosted in FoodTagged apples, pie, recipe. I love old recipes and this looks like it would be an awesome holiday recipe! Thank you for sharing it. Mrs. Lazarus, I am so happy to have stumbled upon you and your blog! We are kindred souls. I have spent countless hours perusing Victorian cookbooks. I have even contemplated starring in my own Youtube videos, cooking long-forgotten gems such as the Apple-Custard Pie you featured in today’s column. I plan to make this pie this weekend. Since I live at a high-altitude, I will have to adjust. I look forward to it. I look forward to hearing how it turned out. It would be a perfect pie for Thanksgiving and other holidays. I also remember fruit/custard pies from my youth. They apparently were more popular back then–though I can’t figure out why they are less common now since they are so tasty. Another great alternative from the usual apple pie. Thank you, Sheryl. It is a very nice apple pie variation. It’s excellent. I think that you’d like it. If you like custard pies, you’d definitely like this one. I love apple pies. This is another great recipe for apple pie! It’s a wonderful apple pie recipe. Since the apples are in a lightly-spiced custard sauce, the flavors are more nuanced and delicate than the typical apple pie. I highly recommend making it a first; I think that you’d like it. I’ve never heard of a fruit/custard combo for a pie. Since I love custard, and like apple pie, this looks like a winner. How do you think it would work done as a custard, in custard cups and a water bath? It would be a way to hold down the calories a bit, and it might be very good. I like your suggestion, and may have to give it a try myself. My mother often used to make pumpkin custard using the same custard recipe that she used for pies–and that always turned out fine. I think that this recipe would also work well with custard cups and a water bath. I love custard pies I may have to try this! This is a wonderful custard pie, so I think that you’d really like it. Wonderful photo. The recipe looks so easy and I can imagine how delicious it smells baking in the oven. Looks delicious. I have all the ingredients. I think I’ll try it this week as a surprise for my husband. Your husband will be a lucky person. This is really nice pie, and I think that he’d enjoy it. One of the things that I like about this recipe and many other old recipes is that they use only readily available ingredients. hmm. . . I’m not sure why it turned out like that. It almost sounds like there wasn’t enough milk and maybe not enough sugar to create the custard flavor and texture. I wonder if the apples you used were much firmer after they were cooked than the ones I used. Perhaps this would require the use of more milk and sugar to get the custard texture. Recipe printed and ready to go. I have never made a pie crust from scratch, so I will buy some in the market’s frozen section today. I can almost smell this pie baking.! I made this for tonight’s desert and it was very yummy. I used Fuji apple slices and they retained their form. We are at very low altitude so it took just 55-60 min. beyond the initial 15 min. I did turn heat down to 325 about 25 minutes in. I’d forgotten how much I like custard pies. Thanks for sharing! It wonderful to hear that you tried the recipe, and that it turned out well. Your notes are very helpful. There is a lot of variation in the amount of liquid from one variety of apples to another, and I think that also affects the cooking time. Yes, I am sure that makes a difference. I used skim milk. Should have mentioned that as well. Enjoy your day! This sounds like the world’s most perfect pie! There’s a diner not too far from here that sells fruit and custard pies and I LOVE that combo! I am making the one!! What a wonderful combo! I like old-time diners. My pie is in the oven right now. Can’t wait to taste it! I’m looking forward to hearing about how it turned out.